Sabhyata, one of India's leading ethnic wear brand launches their first ever Diwali brand campaign featuring the Bollywood veteran, Shishir Sharma along with upcoming movie stars Ritwik Sahore and Ahsaas Channa. The video brings to life Sabhyata's philosophy of celebrating womanhood. This video, by Sabhyata, is an initiative to project the new father-daughter relationship in sync with the modern lifestyle and defines this connection in a new unique way. This thought is executed in a simple yet endearing manner by the central protagonists of the film; the young and free brother, the quiet sister, the supportive yet caring father and the giving mother. Commenting on the launch of this new Diwali Campaign, Chayan Verma, Head of Marketing, Sabhyata, said, "Sabhyata has established itself as a foremost destination for ethnic wear in the last couple of years. The brand is all about celebrating women, her beauty, her existence, her grace and her freedom. This Diwali, we take a step to unfold the new father - daughter relationship and aim to redefine this connection between them." Mr Pankaj Anand and Mr Anil Arora , Co-Founders, Sabhyata, said, "Its high time that society has to change its conventional approach and gender should become a lived reality. Today's digital age though gives us round the clock connectivity to the entire world but this process on the other side is depriving us from some special moments we used to share with our parents. This online campaign by Sabhyata reaches out to generations across age groups and helps them redefine their equation this Diwali." Shishir Sharma is a celebrated Indian film and television actor. He has played remarkable roles in Zee TV's show Ghar Ki Lakshmi Betiyann. He is known for the role of Jagmohan Prasad in Yahaaan Main Ghar Ghar Kheli. Lately, he was seen playing an important role in the critically acclaimed movie Raazi and also in second season of the web show Permanent Roommates of TVFPlay and more. Ahsaas Channa is an Indian actress who appeared as a child actor in Hindi films such as Vaastu Shastra, Kabhi Alvida Naa Kehna, My Friend Ganesha, Phoonk, etc. As a teenager, she has been mostly active in television shows, such as Devon Ke Dev Mahadev, Oye Jassie and MTV Fanaah etc. Ritwik Sahore is an actor, known for Dangal (2016), Flames (2018) and Awkward Conversations with Parents (2018). He made his debut in Vidhu Vinod Chopra's Ferrari ki Sawari and is considered as one of the most promising upcoming Bollywood star. Founded in 2003, Sabhyata is a true reflection of Indian Ethnic wear catering to women from all walks of life. 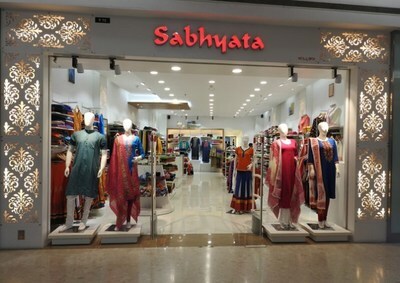 Today, Sabhyata has its presence in 37 cities and 15 states with over 90+ stores in India.